Total Plaza at 1201 Louisiana in Houston. HOUSTON – (Realty News Report) – Brookfield Properties announced that Total, part of the French energy giant, renewed and expanded its lease for its U.S. corporate offices at Total Plaza in downtown Houston. Under the terms of the new agreement, Total will retain its naming rights and lease 305,680 SF of office space, an expansion of 48,452 SF. Total has been the anchor tenant in the Class A building, 1201 Louisiana, since 2005. Total was represented in lease negotiations by Mark O’Donnell of Savills Studley. Brookfield Properties, the tower’s owner, was represented by Clint Bawcom and Jon Dutton. 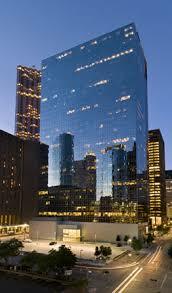 Brookfield, owner of Allen Center and Houston Center, is a major property owner in downtown Houston. Brookfield recently announced a major redevelopment of the 4.2 million SF Houston Center. Recent upgrades to the 35-story Total Plaza include a new fitness facility, adjacent bike room, and destination elevator dispatch in two elevator banks. Brookfield has a history of investing in its assets and future plans include a renovation of the property’s main lobby, including new floor and wall finishes with new lighting and ceilings; modern finishes in the elevator cabs and lobbies as well as new furniture and security console; and, lastly, new signage and graphics on the interior and exterior of the property. Construction will begin in early 2019. Total Plaza was completed in 1971. Brookfield’s recent redevelopment of One Allen Center, included a transformation of the lobby with a modern two-story glass facade; a re-clad, transparent sky bridge that connects One and Two Allen Center; and a complete re-envisioning of the exterior landscaping with a one-acre green space, named The Acre. Future plans include complete lobby renovations for Two and Three Allen Center, as well as the transformation of C. Baldwin, formerly the Doubletree Hotel. Total, which operates in 130 countries, has been in the United States since 1956 and employs more than 6,000 people.